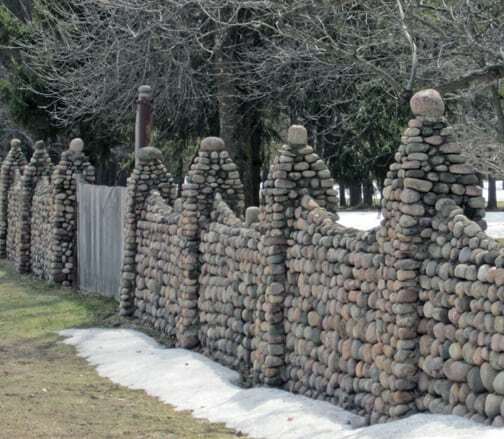 I saw a stone fence in Wisconsin that was absolutely wonderful. It was one of those creations that was a labor of love, I suppose, as well as tremendous skill. Being blessed with some lovely stonewalls of a different style, I wasn’t too covetous, but it did remind me that rocks and gardens are made for each other. Part of the appeal is the contrast between the weight of the rocks and the finer textures of foliage. Rocks also provide a “sense of place” in the landscape: a way to tie plants and the region together in an inherent way. Beyond this, however, is the appeal that man-made objects have when they’re made out of natural materials. The use of wood or stones for creative garden projects often pleases not just our eyes but our spirits as well. Somehow the essence of the rocks and our imagination complement each other and produce something that’s more than the sum of the parts.